# Trim any excess fat from chicken and cut thighs into thirds. # Combine paprika with some salt and pepper in a bowl. 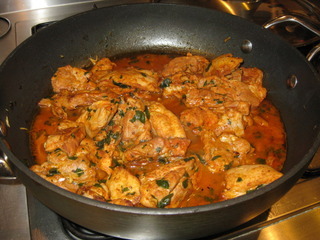 # Add chicken and toss to coat. # Heat half oil in large frying pan over high heat and cook garlic cloves until brown, then remove from pan. # Cook chicken in batches for 5 minutes, or until brown all over. # Return all chicken to pan, add sherry and boil for 30 seconds. # Add stock and bay leaf. # Reduce heat and simmer, covered over low heat for 10 minutes. # Meanwhile, squeeze garlic pulp from the skins and pound with the parsley into a paste using a mortar and pestle or a small bowl and the back of a spoon. # Stir into the chicken, then cover and cook for 10 minutes, or until tender.